I'm looking for something between my tiny swiss army knife and my Helle Fjellkniven that is light but suitable for collecting small wood for using in an ultralight wood stove. Would this CRKT knife be suitable? It's certainly nice and light. 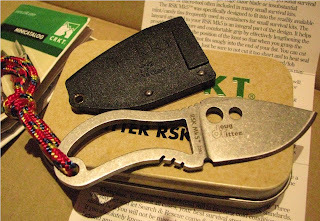 Well i think it might be very suitable,and ive seen those cutting inch thick branches.It dosnt weight anything in my opinion nad its very affordable.Plus the reliability of a fixed blade,compared to any lighweight keychain caliber folding knife.If you grind i shallow u-groove,or sharped the corners of frontal part on the spine of mk5,it might be good for firesteel scraping use too.I will do that small modification when my hands ok,for sure.And someone who likes to play and tie paracord everywhere,might be able to stash emergenzy firesteel inside handle.